a nearly complete view of the world's air pollution has been recently assembled by the National Aeronautical Space Administration ( nasa ). The images reveal expansive clouds of carbon monoxide and other air pollutants over continents and oceans worldwide. The major sources of these pollutants include air pollution from forest and grassland fires as well as human-based emissions from the burning of fossil fuels. Scientists have known for years that human-made pollutants spread far and wide, but this is the first time they have watched it happening from space over a period of almost a year. With the help of these images, policymakers and scientists have a way to identify the major sources of air pollution and can closely track the movement of pollutants. Measurements of Pollution in the Troposphere ( mopitt ), the global air pollution monitor being used for assembling the view, is onboard nasa 's Terra spacecraft launched in December 1999. mopitt is capturing concentrations of carbon monoxide as Terra circles the Earth 16 times a day. The mopitt instrument was developed by scientists at the University of Toronto, Canada. The images were released during a recent meeting of the American Geophysical Union at the Hynes Convention Centre in Boston, Massachusetts. Although mopitt cannot distinguish between individual industrial sources in the same city, it can map different sources that cover a few kilometres. nasa scientists believe that the instrument can differentiate air pollution from a major metropolitan area. "With these new observations you clearly see that air pollution is much more than a local problem. Its a global issue," said John Gille, mopitt principal investigator at National Centre for Atmospheric Research, Boulder. The data has been released for the period March to December 2000. It shows that levels of carbon monoxide are much higher in the Northern Hemisphere than in the Southern Hemisphere due to the large-scale emissions of the pollutant by industries. Another major source of air pollution during the winter in the Northern Hemisphere is the burning of fossil fuels for home heating and transportation. 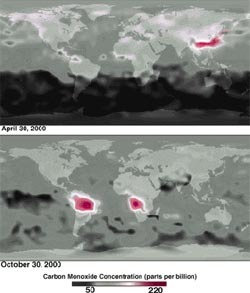 The carbon monoxide plumes in Southern Hemisphere especially Africa can be attributed to forest fires. Gille was surprised to discover a strong source of carbon monoxide in Southeast Asia. The air pollution plume from this region moves over the Pacific Ocean and reaches North America, frequently at fairly high concentrations, according to Gille. "The mopitt observations will help us improve our understanding of the linkages between air pollution and global environmental changes. This will play a pivotal role in the development of international environmental policy," said atmospheric chemist Daniel J Jacob of Harvard University, Cambridge, Massachusetts. "The mopitt observations represent a powerful new tool for identifying and quantifying pollution sources and for observing the movement of pollution on international and global scales," added Jacob. About half of the global emissions of carbon monoxide are caused by human activities. Carbon monoxide is not only a hazardous air pollutant, it is also a chemical compound that produces ozone, a greenhouse gas that is a human health hazard. This pollutant can move upwards to altitudes where it can be blown rapidly for great distances or it can move downward to the surface. Carbon monoxide is a byproduct of the incomplete burning of fossil fuels by vehicles, industry and home heating and the burning of natural organic matter such as wood. By tracking plumes of carbon monoxide, scientists are able to track movements of other pollutants such as nitrogen oxides that are also produced by the same combustion process, but cannot be directly detected from space.